It's a beautiful winter day here on my corner of Katy so I ventured into the backyard to water a few containers. I was stopped in my tracks by a bevy of monarch caterpillars munching away on the milkweed. 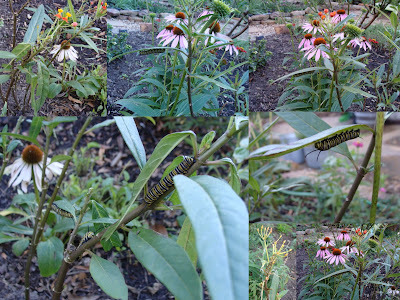 An adult monarch flitted from one coneflower to another, happily nectaring. Their presence is all well and good save for the fact that weather forecasters are predicting a low of 28 tomorrow night. I'd sworn not to cover any plants but I suspect I'll be out there wrapping frost cloth around the butterfly weed in an effort to save my foolish friends. I spent a few moments chiding the matriarch of the clan. "There will be NO ovipositing in this garden today!" Fortunately, there were no human passersby to look askance at my words, only a ruby-crowned kinglet who darted past me and perched briefly on a nearby rose bush to survey the royal photography session. I'm wondering how Mother Nature feels about my assistance ... is she ticked off because I'm interfering with natural selection by assisting the caterpillars to live? If so, she'll just have to get over herself (as mentioned, she already plans to take a chill pill tomorrow) (sorry, it had to be said). At least I don't plan to bring the caterpillars inside this time ... not at the moment, anyway. I did that several years ago and let me tell you, when they decide they're ready to spin their cocoon, those little buggers can move mighty fast! I never did find most of them. On the other hand, were I to just happen by the thrift store and find a small aquarium for them, I do have some leftover screen that could go on top. Meanwhile, Garden Bloggers' Bloom Day approacheth and I believe I'll have some unexpected blooms to share that day. See y'all then! Wow--I can't believe you still have blooms! It's pretty brown up here in Dallas! I hope the monarchs are okay in the cold tomorrow. It is very cold here right now! I bet the frost cloth does the trick...I'll have a little demo for GBBD of what lights and burlap can do..if nothing goes wrong before then! Home Depot is selling plankets for our plants! We need them now with temps in the low teens today and single digits tonight. Since I am commenting late...did you get the monarchs taken care of? That is so strange that you have those little 'pillars! Mother Nature seems a bit confused this year. Mother Nature is very old and a little forgetful, so sometimes she needs a little help. The Monarchs thank you & I thank you, as I so look forward to their visits to my Coneflowers every summer. Crazy little critters! Glad to see them though. My parents bay house had a tree that was covered every year during the migration. Mom used to talk about seeing all those butterflies hanging upside down her that tree. Sad that tree and part of the house is gone now due to Ike. Nature keeps on going...she always finds a way!